I Interviewed Joy in Elliscombe House where she moved in 2012 from her home in Bruton. Her room is warm and sunny with fine views of the grounds on two sides and there we sat with her card from the Queen congratulating her on her 100th birthday and five of her paintings on the walls. She told me that while at school in London she had private art lessons which she thinks were very well taught and which prepared her to be ready at seventeen to attend Chelsea College of Art. There Henry Moore was her tutor for sculpture. “He was a very good teacher, firm and fair and quite exacting in his approach to us. He would not let you get away with making hands like a bunch of bananas. You had to study the planes and get them right.” she said. Joy remembers how at the Academy School the walls were hung with tapestries behind which the amorous could disappear. “You had to be pretty nimble so as not to get caught. “ Then at the end of the first term every student was asked by the head of the school, “So what are you going to do?” She knew that the tactful response would have been to say, “I would like to be a landscape artist.” Instead she answered truthfully that she would like to go into commercial art and earn her own living in advertising. That was not the right answer and she was told there was no future for her at the Academy and she left – with no regrets. She then described how in 1935 her father took her out to Germany and saw her settled in Munich’s leading commercial art school. 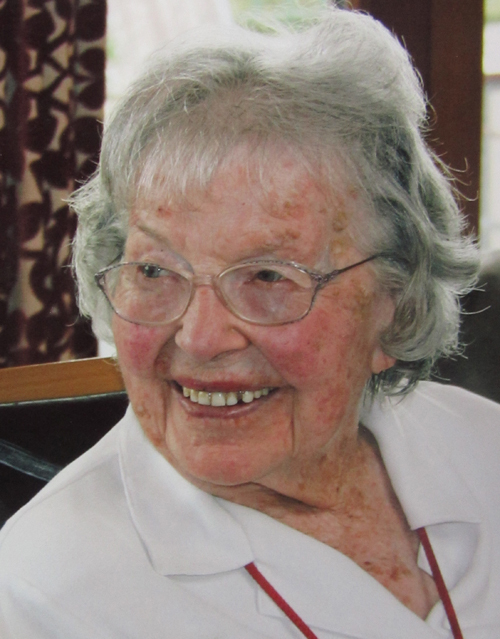 She was there for a year on her own and remembers the students she met being very friendly and she had a lively social time, attending parties and going cross-country skiing at week-ends. She described the school as “very forward looking and modern” and the teaching extremely good – no doubt influenced by the modernist Bauhaus movement. All this was just as Hitler was getting going, but that impacted very little on her, however when she got home she remembers her brother- in- law telling her how surprised he had been when he heard her father had taken her to Germany . He was in the arms business and knew that war was looking inevitable. Now trained, she set out to get work in London’s advertising world and was employed by the Service Advertising Agency, a small agency in Cork Street. Her job was to be part PA to the boss and part administrator. She thoroughly enjoyed working in London and feels that the skills she learnt and the discipline involved in getting things right stood her in good stead when it came to running and starting an art society. After a year in London she married Lt Col Harold Barnes. Harold was then CO to the Second Derbyshire Yeomanry Regiment and in ‘39 they moved to Chesterfield. She had known of him as a friend of the family for some time, but after a dinner date and a dance things developed fast. He was however sixteen years older than Joy and as she came to realise he had been very badly affected by his experiences of being bombed and gassed while serving at the front during the First World War. As the Second World War loomed the pressure became too much for him and he was invalided out of the Army and they moved from their first home down to Somerset. There they settled in Whaddon House on the outskirts of Bruton and soon had two daughters. They took on two cows to provide milk and Joy illustrated a book Harold had written for children entitled, Catching Trout. Joy remembers this time caring for small children and an often deeply depressed husband while the war was on as pretty demanding. There was no time for painting. As the girls got going at school first locally and then away as boarders, Joy found that at last she could paint again and on getting to know other local artists she set about organising an Art Society. She became the first chairman with Norah Ruthven as Vice-chairman and Claudine Bowie as secretary. They decided their programme should include a monthly lecture, a week-end tuition course and an annual exhibition and to give the society a serious image she approached Professor Ernst Blensdorf to be President. He was a respected German sculptor who had been persecuted by the Nazis for his “degenerate work” and for being Jewish. He had arrived in England in 1940 and lived here until his death in 1976. The earliest meetings of the Society were in a large back room upstairs in the Castle Inn, Bruton, but for most of the next thirty years meetings were in Shepton Montague Village Hall. Norah Ruthven then became Chairman and in 1974 was succeeded by Ruth Dowding. The first two exhibitions were held in King’s School library for the wife of the headmaster Joan Davey was a friend and artist member. After that thanks to Roy Davey and the Governors they were able to use King’s Memorial Hall. This continued until 2009 when the hall was re-furbished and the exhibition moved to Bruton School for Girls thanks to the support of the Headmaster John Burrough. Here it was found the lighting in their Main Hall works particularly well. Joy emphasises that she had always seen the society as being dedicated to the pursuit of excellence in art and they were keen to set a high standard for speakers as well. The programme that developed was to have an annual celebrity speaker, a buffet lunch, an afternoon lecture and tea with a musical concert in conjunction with Bruton Subscription Concerts in the evening. She was able to attract big names having Eric Newton, then a leading lecturer in Art History followed by James Laver, the costume historian. She was able also to get the instruction week-ends sponsored by the Carnegie Trust and Roger de Grey – now a Fellow of the Royal Academy – came several times followed by Roland Hilder, Bernard Dunstan and Patrick Proctor. These one day art festivals attracted visitors from far and wide. Joy went on to describe how the Society was an early member of South West Art and In 1981 the society organised a special crafts exhibition in Kings School to run alongside the Art Exhibition. Joy saw this as a great success, it has however not been repeated. From the start then Joy has backed the society membership policy to promote excellence. This was done by having membership on two levels, Associate Membership and Full Membership. Associate Members were those who were keen to attend the events and the exhibition but whose work was not considered ready for exhibition. Full membership was for those whose work had been submitted and passed by a selection committee. This gave Full Members the right to submit work for inclusion in the annual exhibition. This was then judged by a hanging committee of five members. Joy feels this structure acted as a real incentive to those who joined as Associates to work hard to progress. Backing this policy did not always make for popularity, but Joy thinks it helped that on some occasions her own work was turned down. It was agreed however at the AGM in 2009 that this structure might be putting people off from joining and Joy accepts the revised membership policy which is that anyone is welcome to join, but all members need to accept the judgement of a five person hanging committee of three members and two “distinguished outsiders” as to whether or not their work is accepted for the exhibition each year. It was a privilege to interview our founder and a real pleasure to see her in such good form with her lively sense of humour, friendly and straight-forward manner and sharp mind.